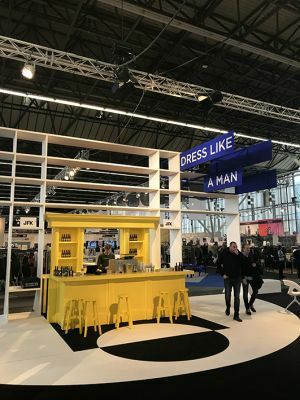 “If you want to meet the Dutch customers, Modefabriek is still THE show,” said Boris Janssen of Dutch agency Fancyfarmers (Knowledge Cotton Apparel, Rains, etc). This sums up the positive result of fashion trade show Modefabriek pretty well. It was split into four halls located again at Amsterdam’s RAI exhibition center on January 20 and 21 and the footfall of visitors stayed on a good level on both days. “Usually on Monday it’s even more crowded because some buyers want to rest on Sunday. Still, we met three new clients on Sunday as well,” stated Yke de With, agent for Miracle of Denim. Though most visitors originate from the Netherlands, also retailers of other nationalities were attending: “Germans and Belgians were coming to our booth as well,” confirmed Ulrich Baekgaard of Gabba. On display were around 600 collections, mainly contemporary men’s and women’s fashion and casualwear, but also footwear, jewelry and accessories by European brands. On a side note it could be overheard that brands are hoping for the Berlin shows to become more attractive again–therefore a move and joint event of all participants at Tempelhof airport location would certainly help. At the same time the Copenhagen shows got some positive mentioning in terms of international visitors’ relevance.